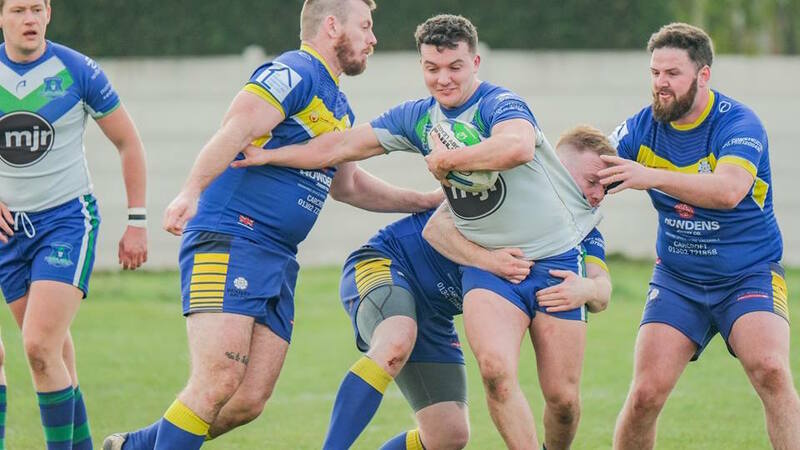 Nottingham Outlaws began their home 2019 Yorkshire Premier Division campaign at Lenton Lane on Saturday with a tough looking match up against last seasons finalists Bentley. Once again they played with plenty of spirit but a much depleted squad were no match for a physically superior Bentley side and they went down to a 40-8 defeat against the powerful South Yorkshire outfit. The Outlaws took to the field with a much changed team to the one that battled so hard up in West Hull last week. With a number of key players missing the coaching team had to dig deep into their reserves to get a 17 man squad out onto the pitch with veterans Steve Page, Ben Scott-Nelson, Stew Readhead and Andy Newsam all appearing on the bench for the first time this season. The match started disastrously for the Outlaws when in their very first attack Bentley advanced the ball down the field with alarming ease and a quick play the ball saw Tom Barker dive over from close range with hardly a hand laid on him. At 6-0 down the Outlaws were clearly still in the starting blocks and two dropped balls in their own twenty put the Outlaws under further sustained pressure. Bentley are not the sort of team to look such gift horses in the mouth and they pounced on the opportunity to add to their score with Shaun Archer adding a quick fire brace and when Tom Flounders added a try in the corner the game was seemingly over as a spectacle with Bentley in a commanding 20-0 lead. Indeed with the visitors 20-0 up after 17 minutes of one-sided rugby the home fans were already looking at their watches fearing the worst! To their credit the Outlaws managed to rally briefly when Charlie Clarke made good yards down the middle of the paddock and a neat kick over the top by Adam Cunliffe was collected by Joe Harrison-Brown for a well taken try to open the Outlaws account and reduce the deficit to 20-4 with eighteen minutes left of the first half. The Outlaws try seemed to rejuvenate the home team who began to ask some questions of the Bentley defence and when Charlie Clarke set Adam Hemingway free the rangey winger went fully sixty yards for a great solo effort to cut the Bentley lead back to 20-8. At this point some of the more optimistic fans began to talk about the possibility of a comeback! Clearly the next try was going to be vital but yet another short range effort straight from the play the ball exposed the Outlaws defensive frailties close to the line and when Matt Wood went over for a try it put the visitors back in complete control, three scores ahead at 26-8 as the half time whistle went. The coaching staff used the halftime break to re-shuffle their cards as Page, Readhaead and Scott-Nelson all came off the bench in a bid to try and wrest the game from the larger Bentley front six. It was important the the Outlaws kept their line intact if they were going to make a fist of it in the second stanza but for the third game running they leaked a try straight from the restart as as Jack Craswell went over and at 8-30 the game was well and truly out of reach for the Outlaws. Despite the odds the Outlaws refused to throw in the towel and they enjoyed their best spell of the game, putting the visitors under consistent pressure for long spells in the second half as Strachan and Whittle tried their best to carve an opening but once again they lacked the cutting edge to get the scores that their possession and field position should have given them. As the clock ticked down the now tiring Outlaws could not find a way through a determined Bentley defence. On the contrary the visitors knew how to make the most of any possession in and around the Outlaws forty metre zone and they showed the Outlaws how to score by adding two further trys as Ryan Craswell and Nick Pownall both added late tries to close out the game 40-8 in the Outlaws favour. The Outlaws take a much needed break over the easter weekend but return to action in two weeks with a home game against New Earswick, a must win game that marks an important run of potentially winnable games that will hopefully see the Outlaws begin to climb the table.